TingleSoft Mobile Video Converter is a simple, stable and fast multimedia converter to convert popular video formats to mobile video. You can convert your video files to 3G2, 3GP, iPod, iPhone, PSP and Zune video. 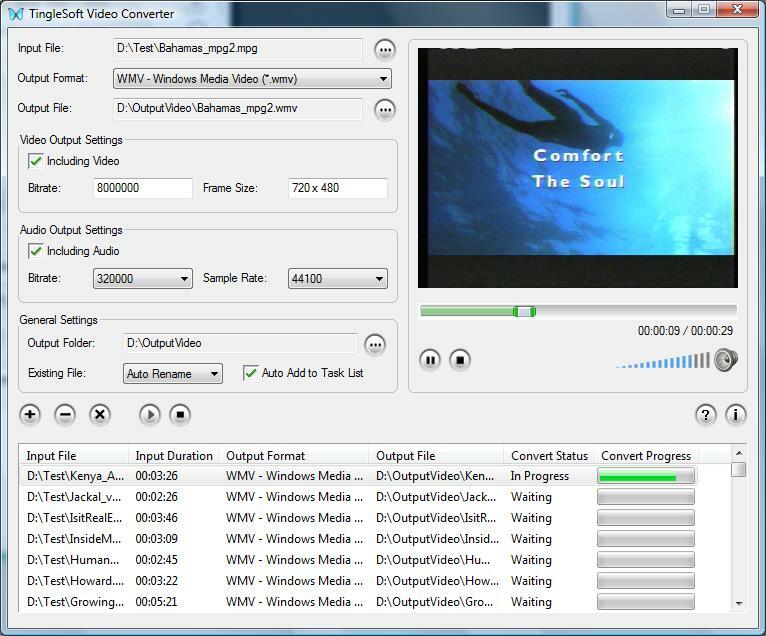 It supports conversion from almost all well known video formats, including WMV, ASF, AVI, MPEG-1 (VCD), MPEG-2 (DVD), MPEG-4 (MP4), QuickTime MOV,RM, RMVB, Matroska (MKV), 3GP, 3G2, DivX and Xvid etc. It supports batch conversion. ...... 3G2, DivX and XviD etc. It supports defining range to convert. It has an embedded player for you video/audio files playback. Qweas is providing links to TingleSoft Mobile Video Converter 2.0.32 as a courtesy, and makes no representations regarding TingleSoft Mobile Video Converter or any other applications or any information related thereto. Any questions, complaints or claims regarding this application TingleSoft Mobile Video Converter 2.0.32 must be directed to the appropriate software vendor. You may click the publisher link of TingleSoft Mobile Video Converter on the top of this page to get more details about the vendor.